*****Get 300 apps for only $19.99 via GoLearningBus Library |*****WAGmob has completed 5 years and we are running a limitedtimeoffer via which you can access all 300 quality appsviaGoLearningBus Library. GoLearningBus providers 1. Schoolbus(K-12), 2. College Bus, 3. Professional Bus and 4. Languagesbuswith more than 50 languages. 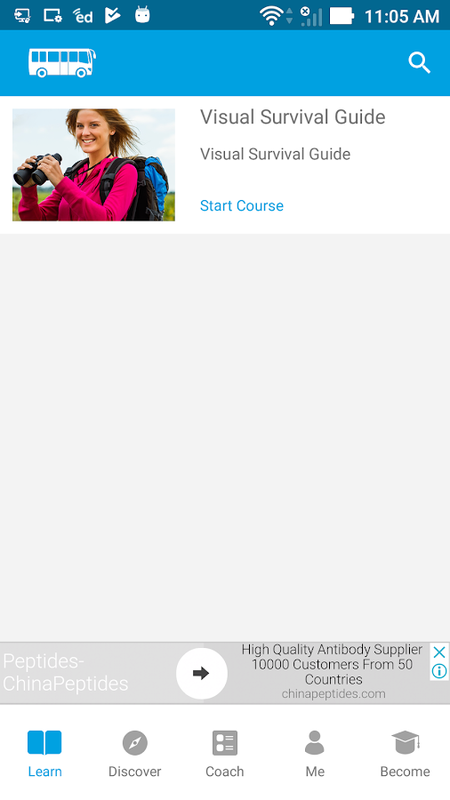 GoLearningBus app provides: 1.Snacksized tutorials. 2. Bite sized flashcards to memorize keyconcepts.3. Simple and easy quizzes for self-assessment.GoLearningBusbrings you a simple, crisp and to-the-point app for"VisualSurvival Guide". You have limited access to the contentprovided.For full access to the content, please login and purchasethisapplication. This app provides a quick summary ofessentialconcepts in Visual Survival Guide by following snacksizedchapters: Environmental Injuries, SignalingTechniques,Introduction, Venomous Snakes and Lizards, FieldExpedientDirection Finding, Sea Survival, Tropical Survival,FoodProcurement, Bones and Joint Injury, Firecraft & How toBuildFire, Basic Survival Medicine, Types of Shelters, PsychologyofSurvival, Planning and Survival Kits, Dangerous InsectsandArachnids, Expedient Water Crossings, Cold Weather Survival,DesertSurvival, How to Light a Fire, Medical Emergencies,WaterProcurement, Ropes and Knots. "GoLearningBus Library"coversfollowing: A) School Bus Grade 3-5 Grade 6-8 High School:Grade9-12 College Entrance Tests Languages B) College BusEngineeringCollege Medical College Business College Law CollegeLanguages C)Professional Bus Professional Programming, ProfessionalDesign,Professional Languages, Professional Software and Tools.D)Language Bus More than 50 languages including German,French,Korean, Mandarin, Arabic, Hindi, Italian and much more. Thisappwill access your personal information like first name, lastname,and Email id. Why GoLearningBus apps: 1) Beautifullysimple,Amazingly easy, Massive selection of apps. 2)Enjoyable,Entertaining and Exciting apps. 3) An incredible valuefor money.Lifetime of free updates! To understand our privacypolicy pleasevisit http://www.wagmob.com/tou/. Please visit usathttp://www.wagmob.com/ or write to us at [email protected] foranyquery and your valuable feedback. Track your progress and become "Certified MyGuide Professional".Show off your proficiency in creating Guides via MyGuide . Thiscourse is free for all users. The GM Financial Mobile app lets you manage accounts anywhere. TheFebruary 2019 update addresses many of the performance issues thatwere in the initial version of the app, while also featuring a newlook, improved navigation and fingerprint authentication. Whereveryour journey takes you, have the tools you need to make paymentsand keep your GM Financial account on track with GM FinancialMobile. This app lets you: • Conveniently access your account 24/7• Make a payment or set up auto pay • See your payment options •Manage multiple accounts This app does not support rooted devices.If you need help with GM Financial Mobile, please message ourCustomer Experience team in the app, or through MyAccount on theweb at GMFinancial.com/MyAccount. You can also message us throughFacebook at Facebook.com/GMFinancial or Twitter atTwitter.com/GMFinancial. This application will help you learn about U.S. history andgovernment while preparing for the naturalization test usingmnemonic illustrations. This app can also be used as aninstructional tool for citizenship preparation. If you are planingto take civics test in 2019, this application will be a good choicefor you. Most people get difficulty when they apply for civics testas they don't know how to be well prepared for such test. USCitizenship Test App 2019 has Following Features * All civicsquestions with HD illustrations(100) * Animated text with audio. *Integrated search engine that searches for keywords in all civicsquestions. * Zoom controls and pinch zoom. Important note: on thenaturalization test, some answers may change because of electionsor appointments. Applicants must be aware of most current answersto these questions. The USCIS Officer will not accept an incorrectanswer.